Oh yes, the infamous Tokeidai (clock tower). You really need to see it to believe it! I remember seeing this for the first time and thinking "Really? THIS is a tourist attraction?" If there was a list of most disappointing tourist attractions ever, this would definitely be in the Top 5, maybe even Top 3. Many people expect to see a large structure but are often let down at its small size surrounded by large offices. Keep your eyes peeled because you really could miss it near a busy intersection. It is one of the few remaining western-style buildings in the city and is often included in tours of Sapporo. The clock still works accurately today and you can hear the chimes every hour. Most people say that this is probably the most disappointing tourist site you will see while you are in Sapporo, and frankly, I agree. 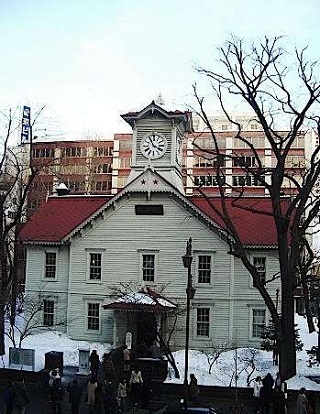 The tower was built in 1878 as a drill hall of Hokkaido University (formerly known as Sapporo Agricultural College).It is the oldest building standing in the city. It was installed by the American company E. Howard & Co of Boston, Massachusetts in July 1881 and in 2009 was certified as a Mechanical Engineering Heritage of Japan. Today the clock tower has a museum displaying the development of Sapporo Japan and the history of the Agricultural College. Not exactly a childrens museums but inside you will be able to see one of the few remaining American blue-eyed Dolls in Hokkaido. Its name is Fanny Pio. I've never been inside and honestly I don't really want to because the outside is so disappointing and so I'm not willing to pay the 200 yen entrance fee. Maybe it's lovely inside. If you do happen to venture inside please write me a message describing it's contents and I'll add it this page. Maybe you can even change my opinion about the Tokeidai. 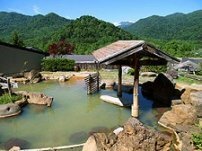 It is a 5-10 minute walk from Sapporo Station and a 2 minute walk from Odori Park. It may be a little hard to find because it seems to blend in well with the surrounding buildings and trees. Just keep your head up and look for a crowd of people posing for pictures. There's also a horse and carriage usually stationed just in front ready to give tours around the city. I haven't tried this before, but it could be something romantic to do if you have a few hours to kill. Closed: The 4th Monday of every month, December 29th - January 3rd. Admission to the Museum: Adults 200 Yen, Children Free.